Here at The Baking Academy of Ireland, we endeavor to reply to all queries within 24 hours. Whether you are booking a course or looking for more information, we’ve got you covered. Please fill out the form on this page to submit your query in writing, or for urgent queries contact the Baking Academy directly on 01 – 845 1214. 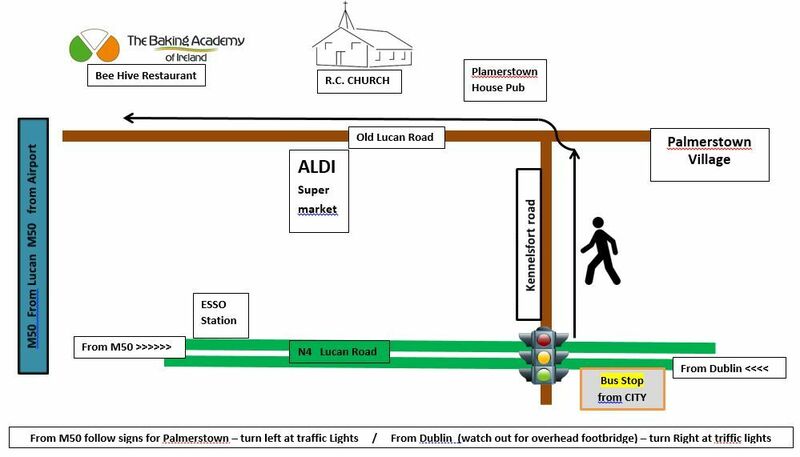 From Dublin City to Baking Academy Ireland (Old Lucan Road) off Kennelsfort Rd. From Westmoreland Street to Palmerstown (Kennelsfort Rd). Short walk to the academy. From Sandymount to Palmerstown (Old Lucan Road). Bus stops at Academy. From Aston Quay to Palmerstown (Kennelsfort Rd). Short walk to the Academy. From Heuston Station (Reached by Rail, Dart or Luas) to Palmerstown (Kennelsfort Rd). Short walk to the academy. Many of the above buses stop at opposite the station main entrance.